We had been told by Andy Rubin that Essential was going to reveal its first product on the 30th May. Today we have finally been given our first glimpse of the said smartphone. After almost half a year of teasing, the Essential smartphone has finally landed with a minimal bezel display up front and what looks like another attempt at making modular smartphones. The Essential takes on the bezel-less design concept that has been recently revived by Xiaomi’s Mi Mix. But it takes the concept a further by having the display wrap around the selfie camera which is at the top of the device. This makes for a less cluttered chin bezel with a better positioned forward facing camera that maximises the space usage at the top of the display. Flip the phone over and the whole exercise in minimalism continues with a total lack of any bumps or undue ridge lines. At the top-left corner is the dual camera setup and on the top-right are the contact pads for modular accessories. Towards the centre of the back, we notice the fingerprint scanner which is a simple circular piece very reminiscent of Google’s Pixel. The designers over at Essential have painstakingly avoided any logo or markings on the body of the phone. On the right flank of the device, one can see the power and volume buttons. We can also see that the antenna bands are directly set into the frame without any wrapping on top or the bottom. 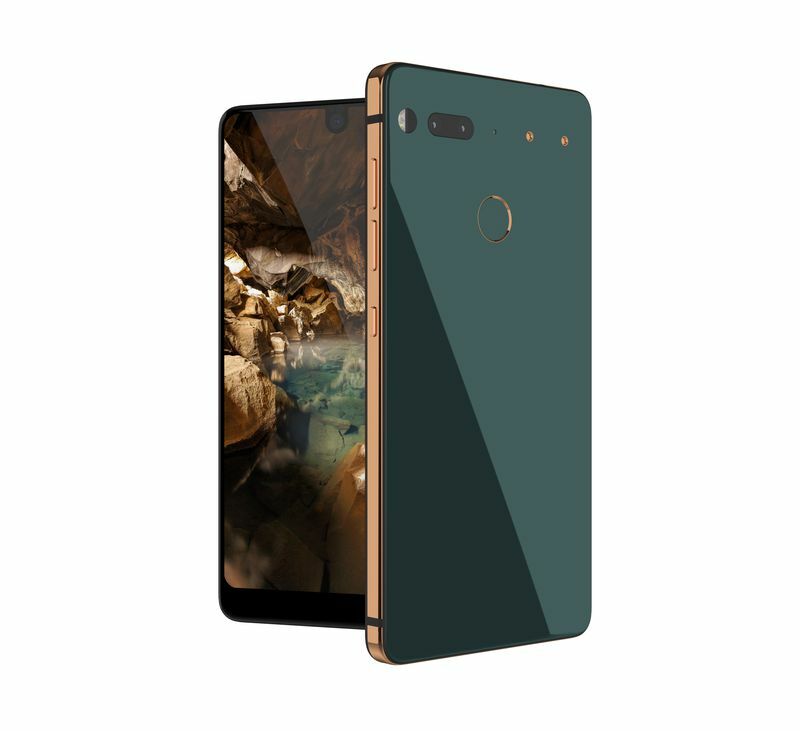 Essential decided to make the phone chassis with a combination of titanium and ceramic. The handset features only a USB Type-C port for charging and hardware interconnectivity purposes with Essential omitting the 3.5mm audio jack on the smartphone but an adapter dongle will be bundled with the handset. Apart from the camera, the company is also offering a charging dock, both of these connect via the metal contact pads on the top-right of the handset. The internal hardware packed inside this upcoming minimalist bezel-less wonder is as follows, at the heart of the handset is a Qualcomm Snapdragon 835 SoC with an octa-core CPU and an Adreno 540 GPU. Coupled with 4 GB of RAM and 128 GB of internal storage. The display is a 5.71-inch QHD (1312 x2560) LTPS panel with an aspect ratio of 19:10 with rounded corners. To power, all this hardware is a 3040mAh fast charging non-removable battery unit. The dual-camera setup on the back of the smartphone is arranged in a colour and monochrome function. Which is unlike other handsets which use the secondary lens to provide an optical zoom or bokeh function. The second sensor will be drawing in more light detailing which can be combined with the regular 13-megapixel sensor it has been paired with for better low-light images. The interestingly positioned and designed selfie snapper up front is an 8-megapixel sensor capable of recording 4K video. All this is packed into the relatively modest dimensions of 141.5 x71.1 x7.8mm which tips the scale at < 185g which is slightly on the heavier side but can be explained due to the use of titanium and ceramic on the chassis. We are hoping that with such a focus on minimalism we get to see a close to a stock variant of Android chugging behind all this hardware but currently no details have been revealed on the same. 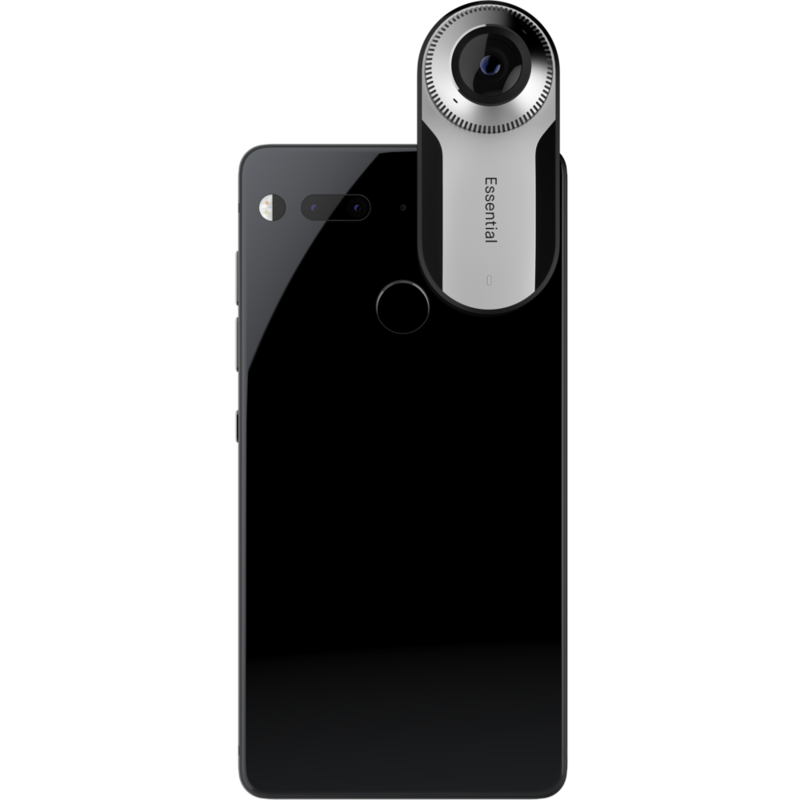 The Essential Phone offers support to a 360-degree camera which is an approach to a modular phone. The 360-degree camera attaches to the back of the phone via two magnetic points. Moreover, the Essential phone’s 360-degree camera comes with live streaming support. The camera can be used to live-stream the content directly to social networks. 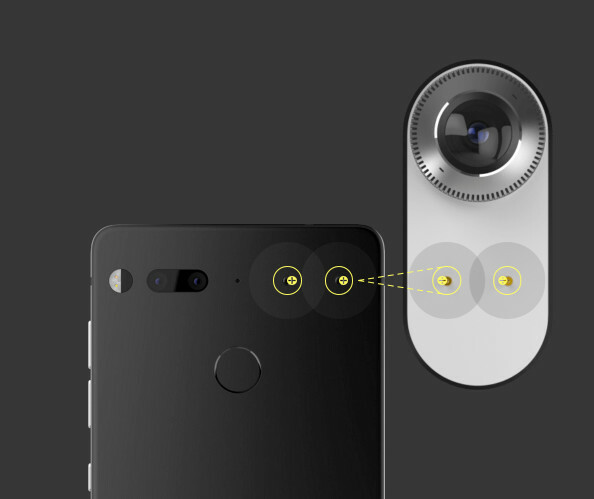 Talking about the specifications of the 360-degree camera, the camera is less than 67mm in height, 32mm in width, and around 12mm (body) in thickness. Most importantly, it weighs only 35 grams which is not much weight added to the phone. There are two 12MP f/1.8 fisheye images sensors with 210-degree field-of-view (FOV) each. The camera is capable of recording 360-degree UHD (3840 x 1920) videos at 30fps. It connects to the smartphone via small metal pogo pins. Also, the camera has 4 microphones with ambisonic tetrahedral arrangement to record audio in 3D. There’s a Qualcomm 8053 chipset which powers the camera. Talking about the price of 360-degree camera, the camera is sold as an extra accessory or bundled with the phone. The camera is priced at $199 but it is currently discounted and is available at $50. The smartphone along with the 360-degree camera is available only in the U.S currently and the smartphone is available for $699. 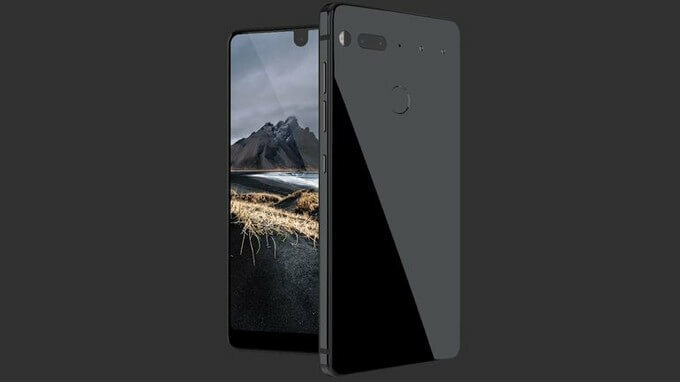 Playground and Essential CEO Andy Rubin announced this evening that his new company’s premium Android smartphone, the Essential Phone, will ship within the next 30 days. Rubin made the announcement onstage at Recode’s Code Conference in a conversation with Walt Mossberg, who inquired about Essential’s timeline for getting the device to consumers. Finally, coming to the price and availability of the smartphone, Essential initially plans to only launch in the US market with a price-tag of $699 (~₹45,000) which instantly places it in the firing lines of established players like Samsung and Apple. But after seeing what the product team has done on their first outing, it just might crack the list.